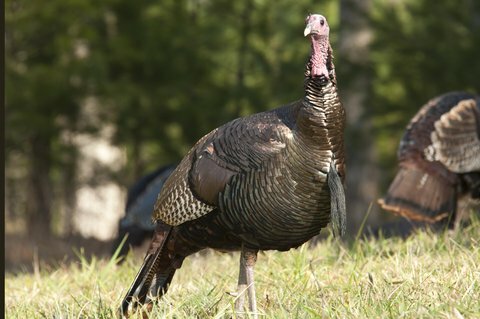 Chasing Turkeys: On Choosing a Shotgun or Bow? The most vexing questions of my life have always been the choice of hunting turkeys with a shotgun or a bow. Every spring day that I step out of my door and slip into my boots, I am wondering what I will grab before hitting the woods. There are advantages to both, along with challenges that may hinder one’s turkey slaying abilities. In some past years, I have hunted exclusively with a bow, however those years were often not as fruitful as the others. One thing I have taken away from those experiences is a knowledge and deep appreciation for the habits of the wild turkey. The first, and most obvious, reason that one might choose to take a bow on a turkey hunt is the challenge it presents. Of course, how original. The bow hunter’s go-to reason for the endeavor. Cliches aside, there are very few feelings more satisfying than watching the impact of an arrow strike a turkey. To make it happen, in fact, is very difficult, yet extremely rewarding. The single most significant draw-back (no pun intended) of hunting turkeys with a bow is the movement associated with it. Turkeys have a very wide field of vision, and their vision is exceptional in the daytime – this is why camouflage is so necessary when pursuing them. It’s often ideal to use a ground blind or even some kind of tree stand, but sometimes this is not always available, especially when there are a group of toms that just won’t get any closer. I prefer using a blind when I have been to that particular spot a few times and I am somewhat familiar with the patterns of the local flocks. When I am constantly on the go, and setting up at the bases of trees, I prefer having a shotgun at my disposal. When I don’t have one, I often try to hide behind trees or brush, draw back behind cover, re-position myself, then let the arrow fly. The last thing you want is a call from your neighbor about a turkey in his driveway with an arrow stuck in it. Or worse, the landowner calling you saying he just got that call. This is a tough situation, because it is not too uncommon for someone to allow you to hunt on their property only with a bow, due to the proximity of nearby properties and the loud noise of shotguns. Don’t be that guy. Make sure that if you are using a bow, you are using suitable broad heads, but most of all you have practiced enough to know that you can knock down a big tom without any issues. Also, being a responsible hunter goes a long way. Though a puffed up tom may look pretty massive, he’s still the same size as he was before he heard the cluck of a hen. This can often deceive a bow hunter with an untrained eye. Grazing a turkey isn’t fun for anyone, especially the turkey. Every archer has a range of comfort, but when shooting at a relatively small target, whose true size is masked by its feathers, a confident shot can be a little tricky. A hunter can score some decent range out of a shotgun, especially with the use of a full choke, but every hunter should definitely gauge their effective range before going afield. I like to do this by taking my shotgun to the range, and deciding on a range that I will still be shooting accurately, while at the same time a majority of my pellets are impacting the target. © Betty4240 | Dreamstime.com – Wild turkey in the fields of Cades Cove.